JD: I think of your seasonal role as Skowhegan’s fresco master in terms of a liminal being or hybrid. There you are artist and instructor, interloper and community member, facilitator and, to a certain extent, participant. How does this particular circumstance influence the work you’ve made there, or the work you’ve made elsewhere? DB: I think it has influenced a great deal. I’m very interested in this category of the “migrant” that Julia Kristeva talks about: a person who moves from one language to another, from one culture to another, and becomes multilingual and this necessitates translation of the whole individual experience into the second language. One is learning everything anew, and through that process reinventing oneself. Most of the words between two languages can be vaguely of proximity to each other, but ultimately there is a contextual experience that you cannot reach, or translate, unless you know both languages and you’ve learned them in both cultures. This brings me back to the question of the hybrid. You acquire a kind of hybrid mind, or hybrid relation to maybe everything. 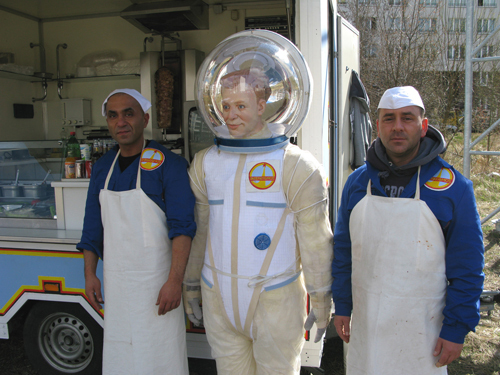 Simultaneous roles are the ones in which you experience reality. That whole notion between who is the instructor and who is the learner, who is the author and who is the reader become interchangeable within the activity. JD: Your work has been described as “sublimely silly,” “squirrelly,” “funny,” “absurdly earnest,” and “spontaneous.” Can you talk a bit about the levity behind the buoyancy? DB: “Levity behind the buoyancy.” This is a congregation of two terms that are oxymoronic next to each other. In some of my work there is that initial, not drive, but outcome that has to do with deflation of power. There are power structures and particular power conglomerates around us. I don’t necessarily mean power of the state but, for instance, the power of meaning to crystallize and not allow any other interpretation. It seems to me that I have an impetus to deflate that. Sometimes, in a very profound situation of deep sadness, there’s even more room, something really ridiculous seems to be part of it too. This extra space, this possibility for another turn, has something to do with the power of oxymoron. There is an absurd side of the ‘necessity for existence.’ On one level, everything that exists justifies its own existence — it exists because it does. The fact that it’s there proves that it needs to be there. On another level, the whole system of trying to understanding this is completely absurd. In the most serious questions of life and death there is not only dark, but an absurd and ridiculous side as well. And I just can’t avoid it. It just comes out. In Bulgaria, for instance, there’s been an early medieval heresy, the Bogomils. They were Christian dualists who were told that the world was created by the God and the Devil at the same time. So there are negative things created by the negative, and positive by the positive. They have this apocryphal saying, “I believe in God, but I don’t trust Him.” The first part of that sentence is like a credo, the second part completely deflates that. Maybe they’re saying, “I don’t trust the human mind that speculates about God.” On one hand I have moments when I experience the profound level of interconnectedness of everything. On another I don’t trust my drive to completely comprehend it, because I appreciate that it’s enormous, it’s inexhaustible. My attempt to know it is ridiculous because I’m ill-equipped. In some of my works you see me experiencing this limitation. JD: Unlike other artists who may use humor as an entryway into explorations of more ambiguous space, you see this absurdity or this silliness as being integral to the weightiness? DB: Oh, absolutely — no, definitely. It’s part of the attempts to know, really. The absurd humor is not simply playing the part of the comic relief. I mean, Dostoyevsky is one of the darkest writers I’ve read, or Kafka, and there is a lot of deeply absurd humor there. You know how sometimes Monty Python reaches this very profound moment of “we don’t know what’s happening here,” it’s just so out there, it’s painfully silly, and, at the same time, you experience certain exhilaration that cuts through the limits of reason. Or Andy Kaufman with his ‘have-beens’ talk show, and his “inter-gender wrestling matches.” He introduces a freshly minted incoherence into the most banal situations, which we think that we know all too well. 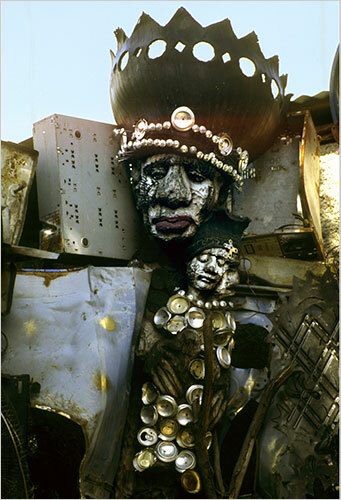 "A funky downtown section of Port-au-Prince called the Grand Rue was the scene, in December, of a first-time art event called the “Ghetto Biennial.” Based on international models but operating on a tiny budget, it brought in a few artists from abroad but was basically a showcase for a collective of Haitian sculptors who call themselves Atis Rezistans. The group’s three senior members — Andr�Eug�ne, Jean H�rard Celeur and Frantz Jacques, known as Guyodo — work together in the Grand Rue, in a warren of cinderblock car-repair shops that supply the material for their art: rusted chassis, steering wheels, hubcaps, broken crankshafts, cast-off oil filters. With the help of young assistants, they turn this industrial junk into demonic doomsday figures with giant phalluses and gargoylish bodies topped by plastic doll heads or human skulls." 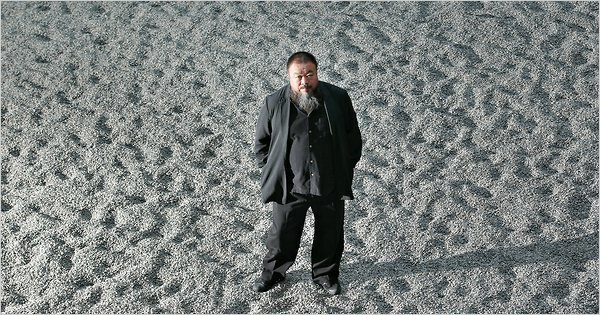 "A phalanx of Beijing police officers confined the prominent artist and activist Ai Weiwei to his north Beijing home on Friday, a move he suggested came at the behest of unnamed but powerful political figures in Shanghai who feared that he was about to embarrass them. If so, they were correct."